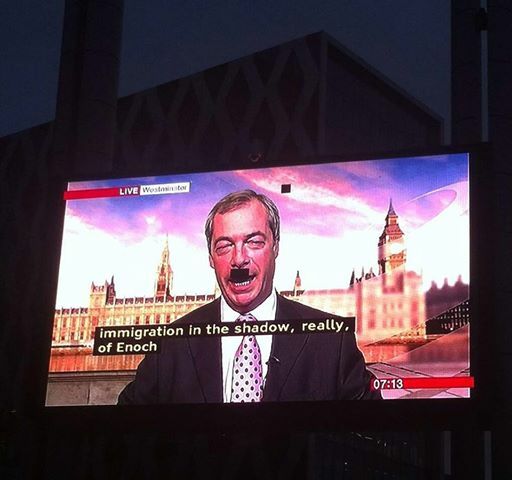 I did laugh at this: A pixelation glitch at BBC Studios gave Nigel Farage, leader of the UK Independence Party, a Hitler mustache today, while he was on the channel talking about the need to limit immigration. This comes after Farage was accused by a former teacher of singing Hitler youth songs while in school. Coincidence? Posted on 20, September 2013, in News and tagged BBC, Hitler mustache, news, Nigel Farage, UK Independence Party. Bookmark the permalink. 3 Comments. This is life imitating art. The “Hitler mustache on glass” thing originally appeared in an Episode of the 1990’s sitcom “Father Ted” – extremely funny. How amazing – I remember seeing that episode way back when! !